Fargo Arts and Culture Commission Strives for Artistic Presence Across the City. With “The Redball Project” making its way to Fargo-Moorhead, the possibility of more public art is quickly becoming reality. The Fargo Arts & Culture Commission is at the forefront of developing free, accessible art to the community to give residents the chance to enjoy creativity and open peoples’ minds to conversation. Arlette Preston sits down at a downtown coffee shop to enjoy an afternoon treat. Art hangs on the brick walls of Atomic Coffee and the buzz of conversation floats in the air. Plates clang and machines whir as people go in and out of line to order coffee. Preston, of Fargo, sits as the current chair of the Arts & Culture Commission. She campaigned to be city commissioner this summer and maintains an active role in the community. Her formal education lies in the medical field, as she received her two nursing degrees and a master’s degree in community health nursing. In addition to her medical expertise, the North Dakota native has the desire to build a beautiful city. She describes the situation in Fargo as two arms, one as muscular and the other under developed. One arm represents sports and is beefed up, whereas the arts are represented by the smaller arm. Growing slowly, but not quite to where it could be. The arts and culture commission is here to help the art community in Fargo achieve its potential. According to the arts and culture commission’s web page, the goal of the commission is to integrate public art into neighborhoods around the city so that residents, no matter their economic status, can experience and enjoy free, quality and public art. The Commission was established in 2015 as part of an initiative proposed by the Fargo Comprehensive Plan Go2030. The plan is set to develop the future of Fargo and ensure that the government, the private sector and the public work together towards a common vision. With that in mind, the Commission set its sights on integrating art into public places, supporting local artists and bringing quality art and creative expression to Fargo. The plan to integrate free public art is intended for the whole city, and not as a feature contained to Fargo’s downtown section. The Commission works in community programming and making recommendations to the city commission regarding commissioning public art and its placement. They also promote public art projects and partnerships between the public and private sector and celebrate equality, cultural diversity and the importance of art in people's’ lives. The Commission, Preston explains, strives to support not only visual art endeavors such as sculptures or murals, but also performance art like “Porch Fest,” a proposed idea for next year, where community members close down the streets and open up their lawns for music and dancing. 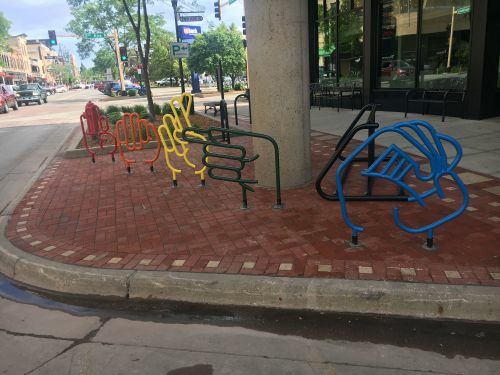 Aside from “The Redball Project”, the Commission one of the projects they provided financial support to was the colorful bike rack that spells Fargo in American Sign Language (ASL). Jeff Knight, a graphic designer of Fargo, was part of the team that brought the bike rack downtown. Knight, along with Brittany Sickler, wrote a grant proposal for functional art in 2015 to the Arts & Culture Commission for the project. Knight and Sickler drew off of support of cyclists and were looking for utilitarian art. They were particularly inspired by bigger cities and their use of public art. The two asked for feedback from the community and Betty Homme, a welder of CSN Welding, approached Knight and Sickler in hopes of creating the piece. She built and painted the bike racks. After the final decision making process, the ASL bike racks were finally finished and installed earlier this summer. Knight has received positive feedback from many people, including the deaf community. “For me, art is a continuous way to spread joy and hone on your own creative processes, which I think, apply to everything in your life,” he said. For Knight, he believes supports for the art has improved and that public art helps create awareness of the scope of artistic expression. He noted, however, that even if support for the arts rises there is always room for improvement. And the Commission shares the desire for continued support for the arts. The benefits are many and include beautifying the city, leveraging private support for cultural and creative arts development, drawing tourism and visitors, economic development and attracting creators, students and younger people to the city. More information can be found on their webpage on fargond.gov. The Arts and Culture Commission has projects lined up for the community and hopes to increase awareness of their goal and of public art. As Fargo grows more successful, the Commission hopes that the arts will grow more successful as well.